With thanks to Phil Moar, Account Manager, Citrus Mix. Hornblower’s was opened in 2010 by Alex and Ruth Grahame, and specialises in locally-sourced seasonal food with an emphasis on seafood, . 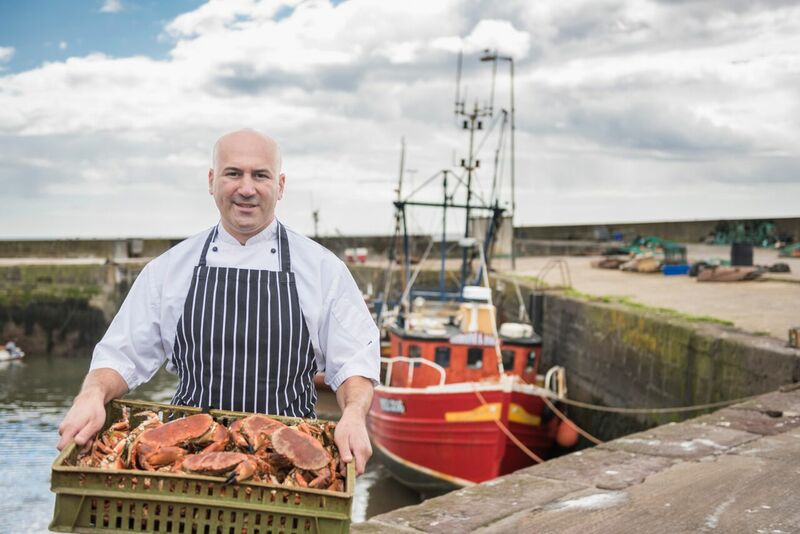 An award-winning Aberdeenshire fish restaurant and takeaway has become 100% Scottish sourced for all its produce after a new deal was struck that guarantees the serving of Scottish poultry in the north-east. For over two years, Alex Grahame, who owns Hornblower’s in Gourdon with his wife Ruth, has been campaigning to find a reliable and certified Scottish supplier for poultry. The restaurant is committed to 100% Scottish sourcing, receiving daily deliveries of fish from either Gourdon or Peterhead harbour, fresh meat from The Store and even salt for its chips from the Hebridean Sea Salt company. Despite this, affordable high welfare Scottish chicken was always missing from the Gourdon menu as a result of the country’s leading suppliers being tied in with exclusive supermarket deals. This shortage of chicken available for independent restaurants has meant that Hornblower’s has had to source its poultry from further afield. But now, thanks to help from supplier Braehead Foods and Richard Lochhead MSP, Scottish cabinet secretary for rural affairs, food and environment, an understanding has been formed that will see a proportion of red tractor assured poultry from Blairgowrie made available by 2 Sisters Food Group in Glasgow. This will allow restaurants like Hornblower’s to dish up the nation’s chicken to its customers. “This announcement is fantastic news for us and really signals an end to over two years of frustration in terms of countless attempts at trying to source affordable, Scottish, high-welfare chickens. “The power of the supermarkets is really there for all to see and I’d like to thank Braehead Foods and Richard Lochhead for their role in lobbying this campaign. To have a guarantee of Scottish poultry for inclusion in our dishes is really a victory for every independent restaurant in the country and highlights that change can happen for the greater good. “Hornblower’s in Gourdon is a great example of serving up Scotland’s fantastic larder on menus. We land the best seafood and shellfish in the world in Scotland, especially in the north-east, and Hornblower’s offers this alongside great Scottish beef and now top quality Scottish chicken too. “It’s great to see Hornblower’s get behind Scottish producers: people want to know the story behind the food they eat especially in this important showcase year of food and drink. “As Scotland takes its steps towards becoming a Good Food Nation, I would encourage as many retailers and hotels and restaurants to follow the lead of places, like Hornblower’s, that are helping Scotland’s growing reputation as the ‘Land of Food and Drink’. Hornblower’s in Gourdon, which specialises in locally-sourced seasonal food with an emphasis on seafood, was opened in 2010 by Alex and Ruth Grahame. Renowned for its fresh produce, the restaurant and takeaway has built up a reputation for showcasing the best that Scotland has to offer from both sea and field. Committed to 100% Scottish sourcing for all of its fish and meat, the restaurant receives daily fresh deliveries of fish from either Gourdon or Peterhead harbour. It has also received critical acclaim, most recently scooping the 2015 Best Chippy Chips in Scotland award from the National Potato Council. It was also awarded with a VisitScotland Thistle Award for best informal dining experience in the north-east and Tayside in 2014. The restaurant has also announced plans to take over the lease for the site of the former Jimmy Chungs and TC Fish restaurant at Aberdeen Beach. The proposal, which has been submitted for planning permission includes a two-storey 16,000 sq ft restaurant facing the sea front with terraces on the first floor and a heated outdoor sitting area on the ground floor. A 650 sq ft takeaway, a 2,500 sq ft ice cream parlour along with two other restaurants, including The Pier Bistro is also part of the plans.